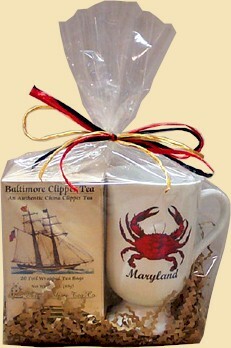 This ribbon bag contains 20 foil wrapped tea bags in 4 different Maryland themed flavors. 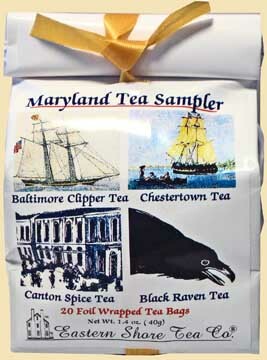 You'll receive 5 tea bags each of: Baltimore Clipper, Black Raven, Chestertown and Canton Spice. This ribbon bag contains 20 foil wrapped tea bags in 4 different Green Tea flavors. 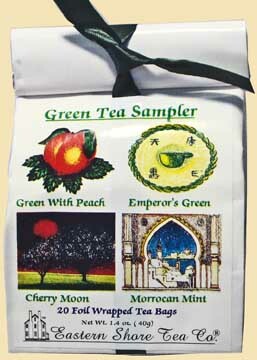 You'll receive 5 tea bags each of: Green with Peach, Emperor's Green, Cherry Moon and Morrocan Mint. This ribbon bag contains 20 foil wrapped tea bags in 4 different fruity Flavored varieties. 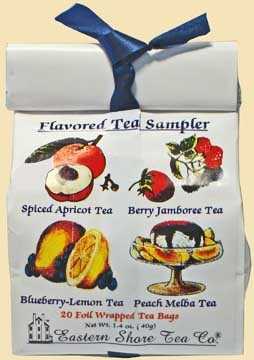 You'll receive 5 tea bags each of: Spiced Apricot, Berry Jamboree, Blueberry Lemon and Peach Melba. Experience a romantic era of American life! 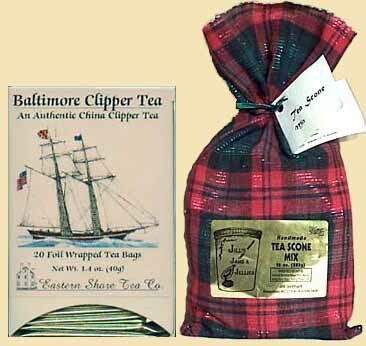 This gourmet tea is a historic re-creation of the China tea carried during the golden years of the famous American Clipper ship (1840's to 1860's). This wonderful blend contains both Black and Green China teas. Try one of our tasty Scone Mixes with any tea. Rich, delicious blackcurrants give this tea it's fragrance and satisfying flavor. 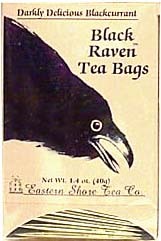 Inspired by Edgar Allen Poe, this luscious tea is darkly poetic and one of our most popular varieties. Made with a blend of blackcurrant tea and blended black teas. 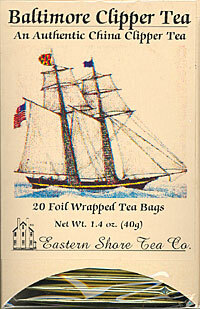 This tea evokes a time when the spice trade of the 16th and 17th century brought new tastes to the world. A fragrant and satisfying tea with a spicy goodness you're sure to love. Made with fine Black tea, Cloves, Star Anise, Ginger, Lemon Peel and Natural Flavoring. Try this unique tea blend for a taste like no other. This is a robust morning tea that's great any time of the day. This blend features the aromatic Keemun Black Tea and anti-oxidant rich China Green Tea. Plus a sprinkling of sunflower petals. Start your day the Chanticleer way! An afternoon tea with scones have been a part of life in Great Britain and America since colonial times. 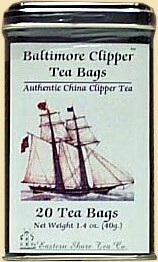 Enjoy our Historic Baltimore Clipper Tea (20 tea bags) and your choice of regular Tea Scones or Double Chocolate Scones. A great combination! This set is for the tea lover. 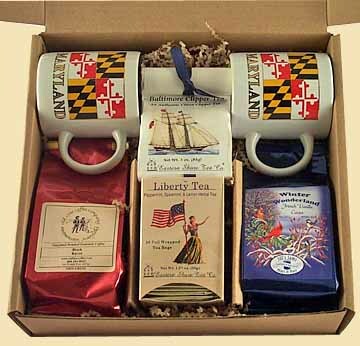 Included is a box of one of our historic tea blends and a Maryland Pedestal Coffee/Tea Mug. 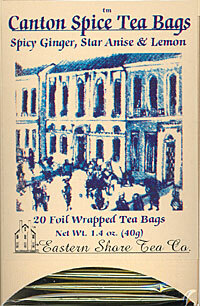 Each box of tea contains 20 tea bags. Packed in a cellophane bag with ribbon tie. 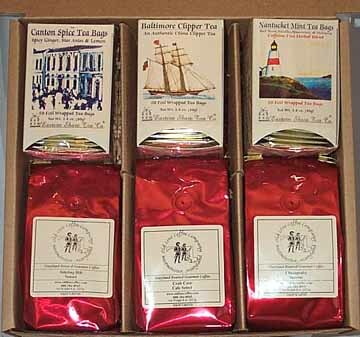 You'll get a lot of cups of delicious coffee and tea with this gift box. Included are: 3 (1/2 lb.) 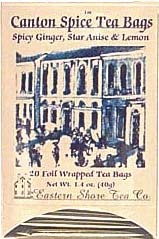 bags of gourmet coffee, perfectly roasted and then ground for use in standard coffee makers; then we've added 3 (20 bag) boxes of our gourmet tea, made from full leaf tea cut to size so the same quality flavor as the loose tea is maintained. **Coffee blends and tea blends will vary based on availability. This gift set has a variety of beverages for appeal to everyone. 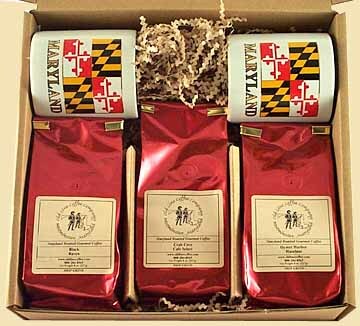 Along with 2 Maryland flag mugs, you'll get a 1/2 lb. of gourmet coffee, 2 packages of 20 tea bags, and three 3oz. holiday cocoas. This comes packed in a box for easy gift giving. Available in any of our standard coffee mugs. Call us at 1-888-284-8565 if you would like a different mug. Some mugs may increase price of gift. This bestselling blend is a combination of the zesty flavor of the highly prized Guatemala Antiqua and the distinguished Tanzania Peaberry which grows on the steeps slopes of Mt. Kilimanjaro in Africa. A peaberry is a small coffee bean that does not split in two when mature and renders a flavor this is concentrated with lighter acidity and full body. These are just a few of our coffees. This bold, rich blend is a combination of full bodied Italian Roast Costa Rican with just the right amount of full body low acidity Indian Monsoon Malabar. You get 3 (1/2lb.) 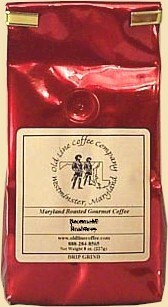 bags of gourmet coffee along with 2 colorful Maryland Flag Mugs. This comes packed in a box for easy gift giving. **Coffee blends will vary based on availability. A perfect gift for coffee lovers! You get a 1/2lb. bag of Old Line Coffee's Crab Cove Cafe Select* and a pewter coffee scoop. The coffee scoop has an embossed crab on the bowl while the back of the handle looks like a cluster of cattails from the marsh. Convenient 2 tablespoon measurement. Packaged in a blue box that's perfect for gift giving. 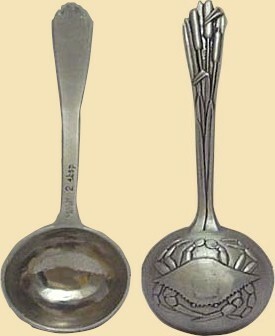 Coffee Scoop made by Salisbury Pewter. *Please note that we may need to substitute the coffee variety based on current availability. Use this spice mix to make delicious mulled cider, wine, or tea. Each package will make one gallon or you can use 1 TB for an individual 8 oz. serving. Can be served hot or cold. 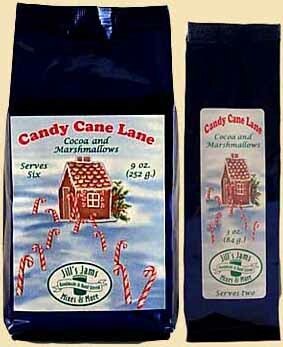 A cup of hot cocoa with marshmallows is a staple for many on those chilly nights. Easy to make, you just combine the mix with hot water and stir. The 3 oz. package makes 2 servings. Use more or less depending upon size of your cup. Can also be made with milk. 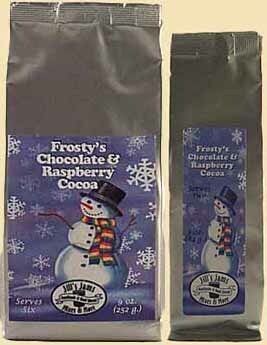 The delicious taste of raspberries is combined with chocolate to make this cocoa a favorite on frosty nights. Easy to make, you just combine the mix with hot water and stir. The 3 oz. package makes 2 servings. Use more or less depending upon size of your cup. Can also be made with milk. 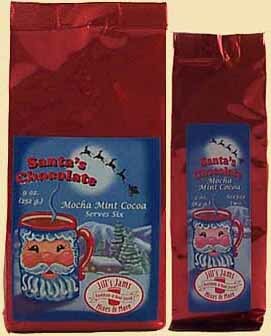 Santa will surely be pleased when he tries this chocolate mocha mint cocoa. Easy to make, you just combine the mix with hot water and stir. The 3 oz. package makes 2 servings. Use more or less depending upon size of your cup. Can also be made with milk. 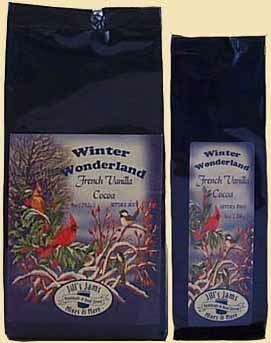 When it's a winter wonderland outside you'll love to sit down to a cup of this French vanilla cocoa. Easy to make, you just combine the mix with hot water and stir. The 3 oz. package makes 2 servings. Use more or less depending upon size of your cup. Can also be made with milk. 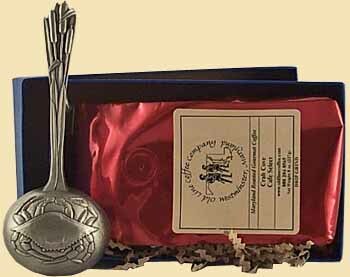 This pewter coffee scoop has an embossed crab on the bowl while the back of the handle looks like a cluster of cattails from the marsh. Convenient 2 tablespoon measurement. Packaged in a blue box that's perfect for gift giving. Made by Salisbury Pewter. *The picture displays two coffee scoops in order to show multiple angles. Scoops are $29.00 each. 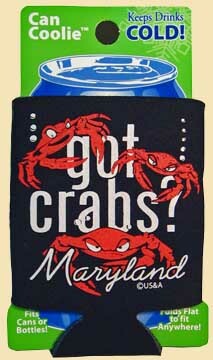 This can cooler's design pictures three crabs with the question "got crabs?". 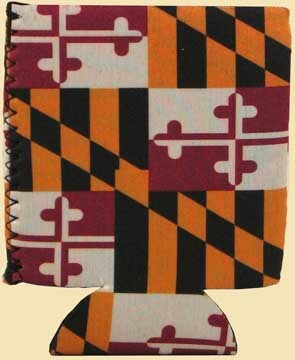 The word Maryland is printed below the slogan. Made of insulating foam this cooler has a padded bottom that acts like a coaster to protect delicate surfaces. Fits standard can sizes and any same size glass. Completely washable. This can cooler has the Maryland Flag Crab design. Made of black fabric covered insulating foam this cooler has a padded bottom that acts like a coaster to protect delicate surfaces. Fits standard can sizes and any same size glass. Completely washable. 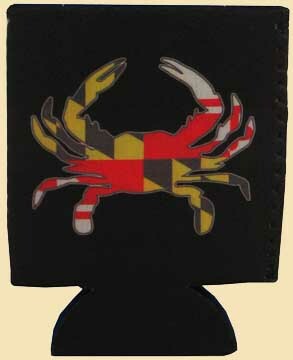 This bottle cooler has the Maryland Flag Crab design. With a zipper closure and made of black fabric covered insulating foam this cooler has a padded bottom that acts like a coaster to protect delicate surfaces. Fits standard 12oz beer or soda bottle. Other size bottles and water bottles fit but zipper may not close on some. Completely washable. This can cooler has a Maryland Flag design. Made of fabric covered insulating foam this cooler has a padded bottom that acts like a coaster to protect delicate surfaces. Fits standard can sizes and any same size glass. Completely washable. This bottle cooler has the Maryland Flag design. With a zipper closure and made of fabric covered insulating foam this cooler has a padded bottom that acts like a coaster to protect delicate surfaces. Keep your drinks cold with this foldable pocket bottle cooler. With a zipper closure and made of insulating foam, this cooler has a padded bottom that acts like a coaster to protect delicate surfaces. Design helps prevent the cooler from slipping out of your hand. 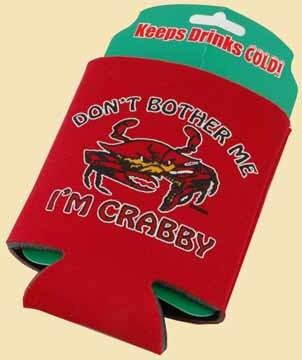 Each side of the cooler has the popular "crabby" saying along with the grumpy looking crab. Keep your drinks cold with this foldable pocket drink cooler. Carry it with you wherever you go. Made of insulating foam this cooler has a padded bottom that acts like a coaster to protect delicate surfaces. Raised design helps prevent the cooler from slipping out of your hand. Fits standard can sizes and any same size glass. Completely washable. 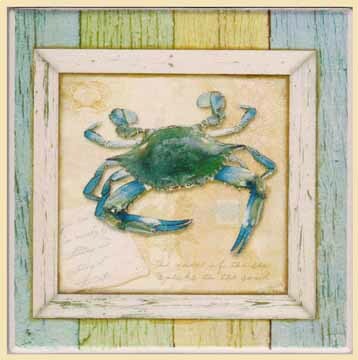 Each side of the cooler has the popular "crabby" saying along with the grumpy looking crab. 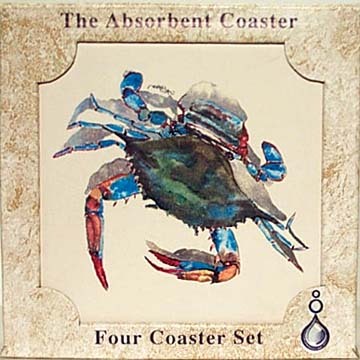 This nice coaster from AbsorbaStone® features a Blue Crab design in a weathered wood style frame. Has a protective cork backing and porous quality, this coaster absorbs those messy drips before it can damage your furniture. Not only useful but an enhancement to your home decor. Easily cleans with a mild detergent. 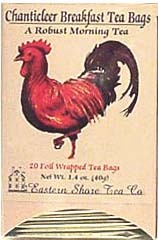 This hand painted English style 30oz. 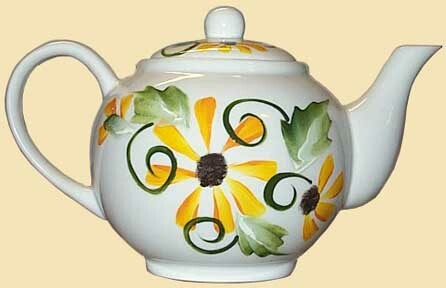 tea pot features a lovely collection of Maryland's state flower, the Black-Eyed Susan. Serves 5 cups of tea. It is dishwasher & microwave safe. Painted and signed by Carroll County, Md. artist, Bonnie. 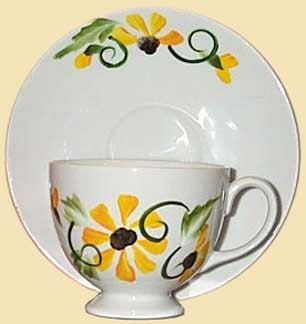 This hand painted pedestal tea cup and saucer set features a lovely collection of Maryland's state flower, the Black-Eyed Susan. It is dishwasher & microwave safe. Painted and signed by Carroll County, Md. artist, Bonnie.